What Is the Standard Size of a Home Garbage Can? If you're pressed for space, figuring out where you're going to put your garbage can may be difficult. Obviously, you want it far enough away from rooms you normally occupy so as not to deal with odor -- so the size of the garbage can you buy is an important consideration since it needs to fit in the space you allocate for it. Wastebasket under desk in home office. A 32-gallon trash can, measuring about 44 inches in height, holds several full kitchen trash bags. A trash can of this size with a lid may work well if you live in a small house or row house without much exterior space; you can place a trash can of this size in the garage or basement. If you live in large single-family home with a driveway on a sizable lot, you could buy a trash can twice that size and set it outside the home, as long as it has a secure lid. 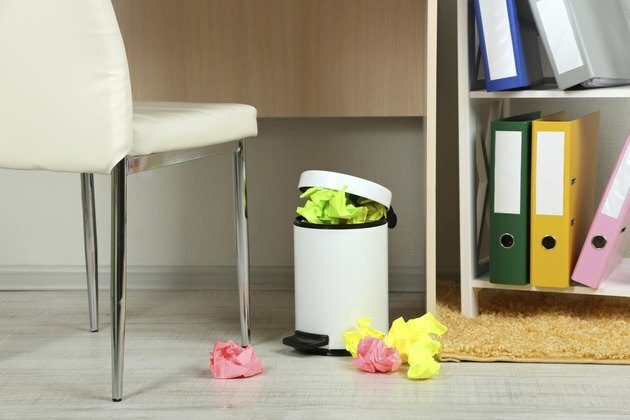 The average 14- to 28-quart, office-size trash can -- the kind you might put under a desk -- measures between 12 and 15 inches high. How Much Space Between a Toilet & a Shower?